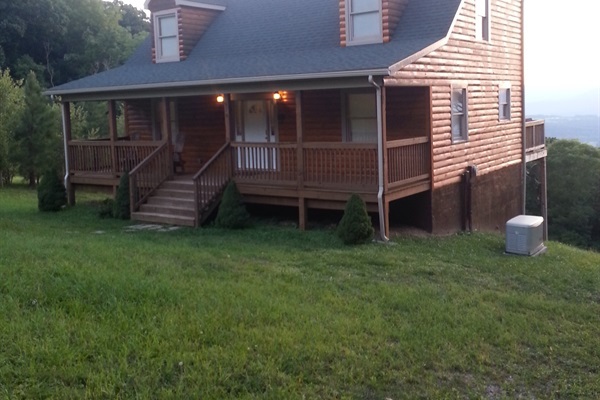 Perched high atop the Blue Ridge Mountains in the beautiful Shenandoah Valley of Virginia, come experience peaceful tranquility in this brand new, four bedroom, two and a half bath log cabin. The cabin is located less than 100 yards from the Shenandoah National Park. While soaking in the breathtaking views, you can also enjoy the fully equipped modern kitchen with refrigerator, stove, microwave, dishwasher, toaster, and coffee maker. As you make your way through the dining room with exposed beam ceilings and pine walls, you pass through the foyer with 25 ft cathedral ceiling to the living room equipped with satellite TV, DVD, and VCR. The bedrooms will welcome you for a restful nights sleep or curl up with a good book until you get sleepy. The cabin is furnished with rustic country decor. You can eat in or grill out on the spacious back deck, filling up with food and with nature at it's finest. You can experience many kinds of wildlife from the deck or you can take a hike in the woods. There are rabbits, squirrels, bear, deer, turkey, pheasants, and grouse for you to admire. To complete your day, you can rock your cares away on the front porch or relax in the six person hot tub on the back deck enjoying the spectacular views of the valley below. This cabin is protected by a Generac Guardian 20kw generator so that you never lose comfort in your stay while in the heart of the Blue Ridge Mountains. Lake Arrowhead-fishing, swimming, paddleboats, volleyball, and basketball. Fishing, canoeing, and tubing the historic Shenandoah River. Hiking or picnicking in the beautiful Shenandoah National Park, as well as Horseback riding. Vineyards and wine tasting. Luray Caverns and the Garden Maze, Skyline Caverns and Mirror Maze, Ski areas, Quaint Country and Antique shops, New Market Battlefield. Seasonal -County Fairs and Festivals. BlueMont Concert Series at Inn Lawn Park. Trout fishing on the Hawksbill. For the kids, the local areas offer paddleboats, waterslides , swimming, ice cream shops, miniature golf, The Luray Zoo, movie theatre, bowling, library, and an indoor water park.